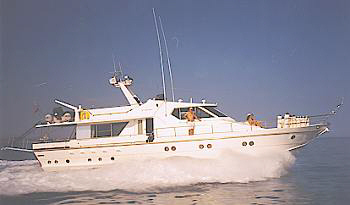 VIP yacht, spacious, fully air-conditioned, ideal for the demanding customer. She has three luxury cabins, two W.C.-showers and two salons. Overall length : 65 ft.
Free basket of fruit and complimentary bottle of wine. Please note that the above price is for the Limassol Bay. For any other destination there will be an extra charge per hour for fuel. Luxury Motor Yacht. Price per day includes 2 hours of fuel.